You want logic, I gave it to you. But no one wants scripture…I say buy water bc I’ve seen what’s coming, but you don’t care for anything outside of sound logic. So your resources won’t last. Even if you wised up & listened to me long enough to stock up a little, rely only on the strength of your arm & the strength of your “apocalypse ready friends”, then you already failed, hilariously failed. Beasts will take your supplies & raid your cabinets for medicines. They will not only take your guns, but shame you as you hold your 5 shooter pistol against their numbers & weapons. Goodness forbid you fire your weapons at anyone, you’ll only complement your sorrow. Walking Dead…then you’ll ask for scripture. And the Christians that say they are Christian but are not seasoned w/the word…but not for lack of reading only, but for rejecting it when when someone tries to teach it to you, as it is written. Preferring your own teachers, quoting man’s worldly wisdom, referencing to their novels & pages…you might as well pick of up the Tao of Winnie the Pooh bc that bear’s got more wisdom…you’ve fated yourself to being naked & afraid…nothing like the show. I’ve done my due diligence. 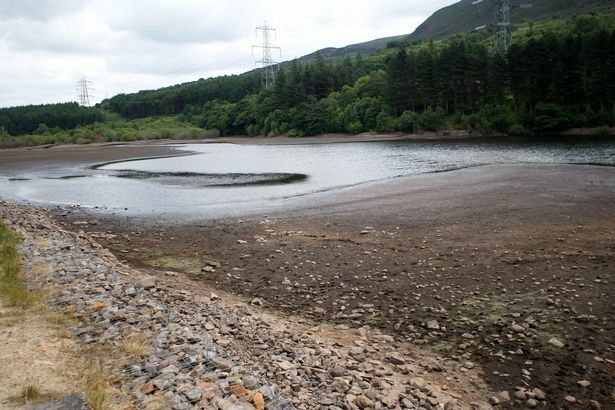 One of the main reservoirs that supplies Manchester’s water is looking dried up and cracked – but bosses are urging us not to panic. An alarming set of images taken over the weekend at Thirlmere in the Lake District show cracked earth and mud where the water is normally up to 40 metres deep. The 3.7mile lake brings water to Manchester via the pioneering 96-mile long Thirlmere Aquaduct. According to United Utilities, Thirlmere and nearby Haweswater reservoir are currently at about 68 per cent capacity. That’s 4pc down on last week, and almost 10pc down on the same time last year when stocks were at 77pc. And there are also reports of low water levels up in Saddleworth, encouraging day-trippers to go swimming despite the signs warning against it. At the end of last month, the Saddleworth Independent newspaper tweeted an image of a ‘disappearing’ duck pond in Uppermill which has left local wildlife high and dry. It comes as forecasters are predicting a three-month summer heatwave. The national weather service is warning emergency services, transport leaders, business chiefs and councils of the risks of a hotter than normal three months.